Although Tropical Storm Jose was located off the coast of southeastern U.S. it is stirring up the waters along the U.S. East coast, causing dangerous conditions. NOAA's GOES East satellite saw Jose centered about 360 miles northeast of the southwestern Bahamas on Sept. 15. 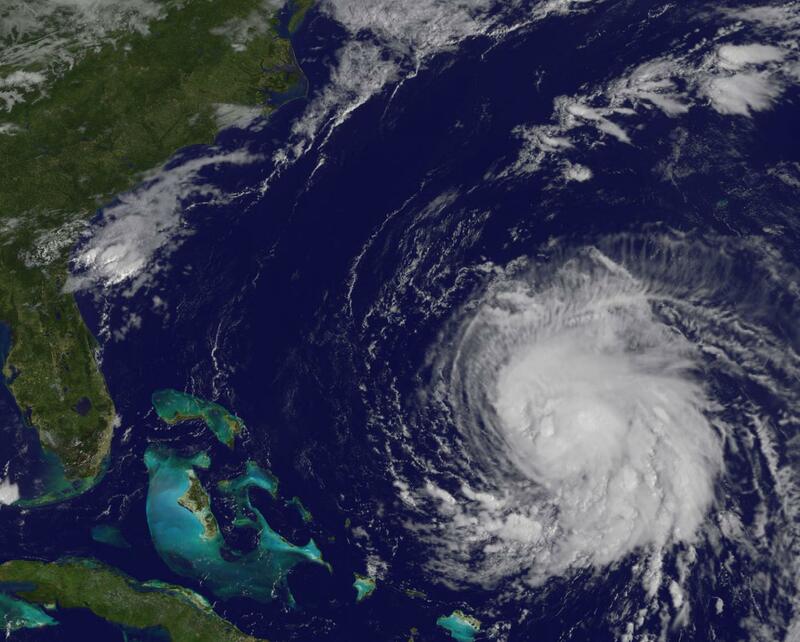 The National Hurricane Center said "Jose is expected to produce high surf and life-threatening rip currents along portions of the U.S. East coast." On Sept. 15, 2017 at 9:30 a.m. EDT (1330 UTC), NOAA's GOES East satellite captured a visible image of the Tropical Storm Jose northwest of the Bahamas. NHC noted that Jose is showing signs of becoming better organized. The low-level center is embedded well within a growing central dense overcast. At 5 a.m. EDT (0900 UTC) the center of Tropical Storm Jose was located near 25.9 degrees north latitude and 68.7 degrees west longitude. That's about 360 miles (575 km) northeast of the southeastern Bahamas and about 500 miles (805 km) south-southwest of Bermuda. Jose is moving toward the west-northwest near 8 mph (13 kph). The NHC forecast calls for a gradual turn toward the north on Sept. 15 and 16. The estimated minimum central pressure is 989 millibars. Maximum sustained winds are near 70 mph (110 kph) with higher gusts. Some strengthening is forecast during the next 48 hours. Jose is forecast to become a hurricane later today. NHC said "Swells generated by Jose are affecting Bermuda, the Bahamas, the northern coasts of Hispaniola and Puerto Rico, and the Southeast coast of the United States, and will spread northward along the Mid-Atlantic coast of the U.S. during the next few days. These swells are likely to cause life-threatening surf and rip current conditions." Forecasters caution that the track of Jose should be watched. Interests from North Carolina northward to New England on the east coast of the United States should monitor the progress of this system over the next several days. For updates on Tropical Storm Jose, visit: http://www.nhc.noaa.gov.